When you stay at Wyndham Lake Buena Vista Disney Springs® Resort Area in Lake Buena Vista, you'll be in a shopping district, within a 5-minute drive of Disney Springs® and Disney's Typhoon Lagoon Water Park. This 4-star hotel is 1.5 mi (2.5 km) from Disney's Lake Buena Vista Golf Course and 2.8 mi (4.6 km) from Orlando Vineland Premium Outlets. 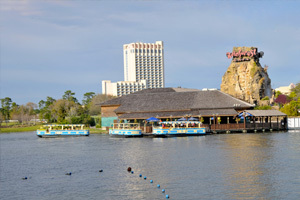 The preferred airport for Wyndham Lake Buena Vista Disney Springs® Resort Area is Orlando, FL (MCO-Orlando Intl. ).